This set is made in a scrappy style to evoke some fun and liveliness. The front of the placemats are quilt-as-you-go style, enabling the back to be clean and largely free of stitches. The coasters are done in the same technique, though on a smaller scale. Both the placemats and the coasters are fully reversible. Although the individual pieces have random piecing and patterning, the set has a cohesiveness due to the use of the same color palette, largely the same fabrics, and styling. 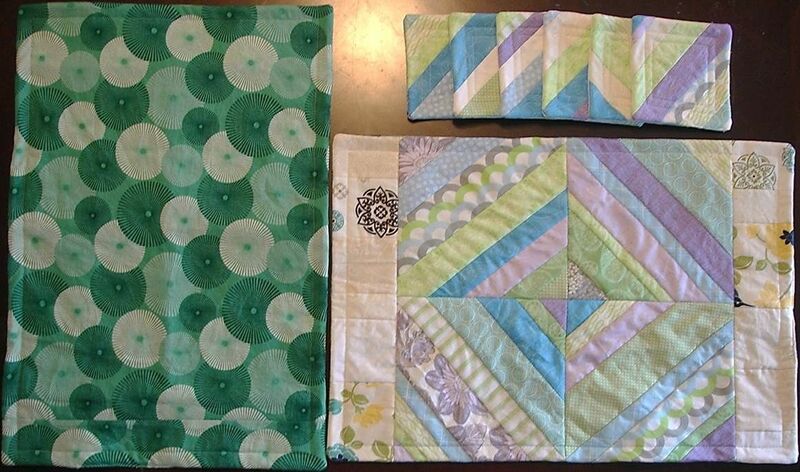 All fabric is 100% cotton, quilter's grade, and the batting used is 100% cotton Warm and Natural (or Warm and White).